Back in 2009, I had this kinda nutty, out of the blue idea for Gottabook - what if I could share a never-before-published poem by a different children's poet every day during National Poetry Month? I had no real plan on how to get the poems, exactly, nor any inkling of whether people would be interested in me throwing this big event. It turns out that everyone I asked said yes, with many poets writing brand new poems for the occasion. Thousands upon thousands of people visited the blog during April or subscribed to the poetry email list, and notes came from teachers around the world who shared these new poems every day with their students. There was coverage in School Library Journal and elsewhere. It was such a success that I turned it from a one-off idea into a series, continuing with new poems until 2013 and new poets every year but one. From Jack Prelutsky, whose poem opened the whole thing, to Naomi Shihab Nye, whose poem closed out 2013's event, to everyone in between, the work that was sent in was incredible and a huge privilege to be able to share with you all. 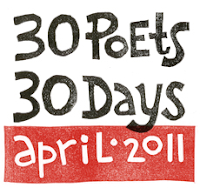 If you visit the blog, you can find all the poets for each year's 30 Poets/30 Days listed along the left hand side... with a click of a poet's name leading to their contribution. You can also click on the logos below and arrive at a recap post for each year with links to all the poems. I truly can't say enough good things about the work you'll read, or about how amazing the people who write poetry for kids are. I do hope you'll check all the links out. Once again I say thanks to the poets, the logo creators, and the folks who read daily. Without y'all 30 Poets/30 Days wouldn't have been a success and wouldn't have made it into my flashing back on 10 years worth of memories! And if all the above isn't enough, I have good news: it's Poetry Friday, and you can find the roundup of this weeks' links at Buffy's Blog. I hope your Poetry Month finishes strong. 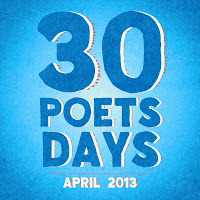 Around these parts, every month is Poetry Month... so I look forward to seeing you back here in May, too. I loved following your series and using it to introduce my sixth graders to poets new-to-them. Thanks for creating this forum for sharing, for extending the invitations, and for sharing with all of us! Such an amazing collection of collections! Thank you (again)!! Such a wonderful idea and thanks for sharing the links back to all those delicous poems. I'm going to have fun exploring them over the next few weeks. Thank you for giving me a shot in the April poetic festivities for two years. Meant a great deal to me birthday pal. Blog Flashback #6 - A Rhyming Interview!